Rookie Carlos Munoz was top driver for Andretti Autosport at Long Beach on Sunday. FORT WORTH, Texas – Rookie Carlos Munoz was almost apologetic after his podium finish in Sunday’s 40th annual Toyota Grand Prix of Long Beach, where the 22-year-old Colombian emerged as Andretti Autosport’s coolest shoe. Ask Ryan Hunter-Reay, Munoz’s Andretti Autosport teammate. The 2012 Verizon IndyCar Series champion, Hunter-Reay dominated on the 1.968-mile/11-turn street-course. But RHR also triggered a seven-car accident 24 laps from the finish when he tried to overtake Josef Newgarden in the Turn 4 right-hander. The incident eliminated both Hunter-Reay and Andretti Autosport’s James Hinchcliffe – as well as Newgarden, rookie Jack Hawksworth and reigning Indianapolis 500 champion Tony Kanaan. The accident appeared to open the door for three-time/reigning series champion Scott Dixon to win at Long Beach for the first time. But Dixon, of Target Chip Ganassi Racing, was forced to stop for a splash of E85 fuel with two laps to go. That gift-wrapped the lead for Conway, and the Brit cruised to his third career victory in the car fielded by owner/driver Ed Carpenter. Power, of Team Penske, finished less than a second behind Conway with Munoz third and countryman Juan Pablo Montoya fourth. Simon Pagenaud finished fifth after rebounding from an early race spin courtesy of contact with Power. Munoz, who has five career INDYCAR starts, earned his first podium via a solid second-place drive behind Kanaan during the Indy 500 last May. That result earned Munoz Rookie of the Year honors…and basically punched his ticket to this fulltime IndyCar Series ride. Munoz will turn his attention to the six-race oval-track portion of the schedule on Wednesday and Thursday during a Firestone tire test on Texas Motor Speedway’s high-banked, 1.5-mile quadoval. Eighteen car/driver combinations representing every team are expected to participate in the sessions, which will help sanctioning body INDYCAR and Firestone evaluate potential changes for the speedway package used during the annual Firestone 600 night race here on Saturday, June 7. Additionally, Munoz, Mikhail Aleshin of Russia and Englishman Hawksworth will undergo rookie evaluation/testing while racking-up oval-track miles prior to lapping the 2.5-mile Indianapolis Motor Speedway next month. Carpenter, meanwhile, will replace Conway in the No. 20 Fuzzy’s Ultra Premium Vodka Dallara/Chevrolet at TMS before beginning practice May 11 for the Indianapolis 500. Some of Munoz’s frustration Sunday can be traced to his victory on the same Long Beach circuit in Firestone Indy Lights competition last spring. Power will take a 93-66 point lead over Conway into the April 25-27 Honda Indy Grand Prix of Alabama at Barber Motorsports Park in Birmingham, where he has started on-pole and won twice. Hunter-Reay is the defending event winner. Reigning LBGP champ Mike Conway will spend this weekend at the famed Silverstone circuit in England competing in one of his part-time gigs – a six-hour sports car race for Millennium Racing – before jetting back to the States for the Honda Indy Grand Prix of Alabama. The cross-continent, multi-series schedule has become Conway’s choice as a freelancer. After opting to exit his ride with A.J. Foyt Racing prior to the 2012 season-finale on the 2-mile Auto Club Speedway oval in Fontana, Calif., Conway coaxed five top-10 finishes – including a victory and third-place at Detroit –out of seven starts in 2013 with Rahal Letterman Lanigan Racing and Dale Coyne Racing. Ed Carpenter, the lone IndyCar Series team owner/driver, hired Conway to run this season’s road and street-course events in the No. 20 Fuzzy’s Ultra Premium Vodka Dallara/Chevrolet. Carpenter will concentrate on the oval portion of the schedule while solidifying the business side of his three-year-old team. Conway placed 16th in the season-opener on the Streets of St. Petersburg, Fla., and starting 17th for Sunday’s 80-lapper at Long Beach admittedly didn’t do much for his confidence. But as he’s experienced throughout a career that began in British Formula Ford, if you’re not challenging you’re not driving. Conway inherited the lead when three-time/reigning IndyCar Series champion Scott Dixon had to pit for a splash of fuel on Lap 78. Conway then held off Will Power of Team Penske and rookie Carlos Munoz of Andretti Autosport to win by less than a second. 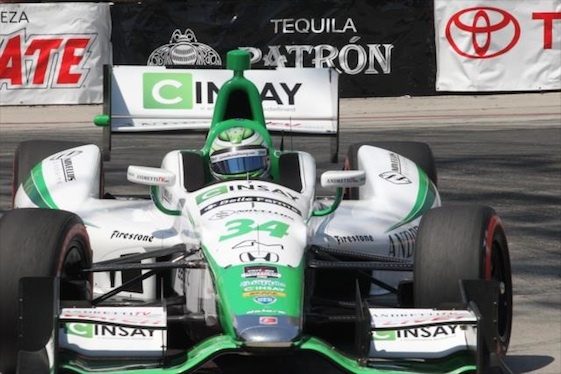 2 _ Wins at Long Beach by Mike Conway. The Englishman became the sixth driver to win on the Southern California circuit more than once, joining Mario Andretti, Al Unser Jr., Paul Tracy, Alex Zanardi and Sebastien Bourdais. 3 _ Sunoco Rookie of the Year candidates in the top-10. Carlos Munoz finished third, Mikhail Aleshin placed sixth and Carlos Huertas finished 10th. 5 _ Consecutive Long Beach races led by Ryan Hunter-Reay, who paced the most laps Sunday (51 of 80). 6 _ Lead changes on the Streets of Long Beach; the previous five races averaged 5.5 changes. 12 _ Consecutive seasons during which Scott Dixon has led an IndyCar Series race. 16 _ Positions improved by Mike Conway (17th to first), most of any driver in the race. 105 _ Point lead Chevrolet earned in the Manufacturers’ Championship standings by placing three cars in the top-five at Long Beach. Chevrolet leads Honda 247-142.